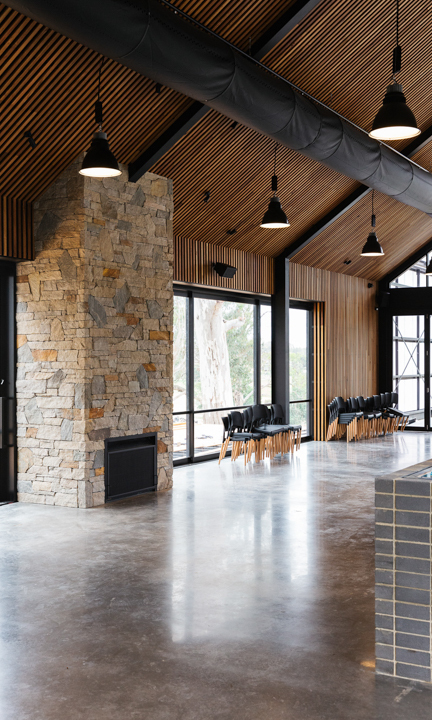 It's been a long time coming, but Lot 100 - the Nairne facility now home to the small conglomerate of Adelaide Hills producers, Mismatch Brewing, Adelaide Hills Distillery, Adelaide Hills Cider, Vinteloper and Ashton Valley - is ready to redefine what a cellar door experience can be. “We’ve kind of started our own little city, haven’t we? We could start a cult,” Sacha La Forgia grins, as he, Ewan Brewerton of Mismatch and David Bowley of Vinteloper discuss the incredible feat of Lot 100. Launching 8 December. Details available here. Driving into the property, on freshly laid bitumen, the scale of the production shed and its companion hospitality venue is immediately apparent. What’s less obvious is the engineering that’s occurred over the nearly two-year build period to make this a reality. “It’s important to remember, nothing’s provided by council, so there’s no water supply, there’s no sewerage – everything had to be laid,” Sacha continues. Behind the production shed sits the water treatment facility – the second most expensive piece of equipment on the site after the brewery – which pulls bore water out of the ground, strips it of all salts and minerals via reverse osmosis, and then feeds it into the shed where each of the beverage producers operating in the shed – Mismatch, Adelaide Hill Distillery, and Adelaide Hills Cider – can create a water profile to suit their needs. Lot 100’s ‘solar farm’. This image supplied. Once the water has been used, the wastewater is fed back into system, treated, and spread to the soil throughout the property and used to water crops, which then feeds the cows, creating a closed loop on site. The same process is used with spent grain from the distillation process, which is divvied out to local livestock and the Lot 100 kitchen. Electricity on the site has been taken care of by “about 17 square kilometres of [solar panels]. It’s a solar farm on the roof,” Sacha says. With so much infrastructure, it really has the feeling, as Sacha joked, of a small city, constructed solely to service South Australia’s (and the country’s) growing desire for locally produced quality beverages. It’s an achievement that could only have been achieved through the coming together of five likeminded businesses: Mismatch, Adelaide Hills Cider, Adelaide Hills Distillery, Vinteloper, and Ashton Valley, each with a clear vision for where their industry should be going. “It very much stems from our ethos, what we’re all about, everyone in the company” Ewan says. “If you look at the identities of who Hills Distillery, Mismatch, Hills Cider, Ashton Valley and Vinteloper are, it seems obvious to me that they’re all complementary and that they speak to the same audiences, but from different perspectives,” David continues. The venue has already seen a wedding and a distilling conference (Lot 100’s head chef, Tom Bubner of Pizza e Mozzarella and Chicken & Pig, catered for over 100 distillers with only half a working kitchen), but its official launch is 8 December, after which time the trio say they’re hoping for an array of visitors – from singles and couples drivin up for a look, to bus tours and larger groups – to experience the many aspects of the new space. Adelaide Hills Distillery x Mismatch x Vinteloper. Inside the venue, the bar will showcase an enormous range of products available from each of the producers, and also has the functionality to service the concrete piazza running along the side of the building that faces the brewery. On the other side, a deck overlooks the stunning Adelaide Hills apple orchard, and at the end of the venue there is an open-faced glasshouse that can be shut off for private functions. The brewery itself has also been designed with visitors’ experience in mind; a mezzanine overlooks both Sacha’s distilling equipment and the brewery, where there will be a bar hosting gin blending experiences and smaller-scale events. Vinteloper’s production will remain at their Adelaide Hills property – the lively flora required for making characterful wine is not such a great addition to a hyper-clean brewery floor – but it is David’s intention that barrels of Vinteloper wine will eventually sit alongside Sacha’s growing stack of whiskey barrels. Once the chaos of launch has settled, a “little farm” will also be established that will supply the kitchen and will feature a botanical garden for Adelaide Hills Distillery. As much as this property is about the years of hard work of the producers as a collective, it is also a signifier of how far South Australia’s beverage industry has come in what has been a relatively short time. “We’re actually suggesting to SA Tourism ‘Stop promoting us as a food and wine destination, it’s a food and beverage destination,’” Sacha says. “That’s a big change. Five years ago, there was a bit of craft beer, a few spirits… but in that short time there’s been this massive change that’s largely consumer-driven. People seeking out these new experiences, and they’re seeking out quality… It’s a big paradigm shift. CityMag fears we’re being premature in asking what the property will eventually evolve into – throughout our chat, the group’s attention is constantly pulled to where finishing touches need to be applied, and that will no doubt continue up until Lot 100’s December launch. Despite this, the bigger picture is still playing out in Ewan’s mind. “I can’t wait for two, three years down the track when the place has got that feeling where you’ve got the people, you’ve got the gardens, we’re selling the produce to the punters, where they can pick up a six-pack of cider or beer or a bottle of gin on a Saturday, you’ll be able to get fresh meats and everything else as well,” Ewan says. “I think that’s when it will really shine… We’ll have our culture, everything will be just-“ Ewan catches himself gesticulating wildly in excitement, “I can’t describe it through hands,” he laughs. CityMag can’t help but feel excited too. We, like everyone else in the city, have watched as more and more real estate on back bars and tap lines has been given over to our friends making booze and their contemporaries, and similarly the people we bump elbows with while lining up for a drink are more often opting to support their hard work. Lot 100 is the physical embodiment of this attitude. It’s not simply traditional South Australian parochialism, but a culture of quality and authenticity that has permeated the national beer market, taken hold, and is now setting a new standard in booze, food and hospitality.